If you’ve been reading this blog or following me on Instagram for the last few weeks, you already know that I have been in Europe on my honeymoon. It was fantastic and the food was probably the best part. Sorry to rub it in; I only mention it because I managed to go the whole trip to London, Paris and Istanbul without eating any bread or pastry, little dairy, and nearly any refined sugar. It IS possible.I made a few exceptions to my normal diet – primarily to allow some rice, potatoes, legumes and cheese as we moved between cuisines – because the quality of the ingredients is better in Europe in many cases (and so, easier to digest), and also because it’s vacation and therefore temporary, so I wasn’t so worried about being perfect as long as my body was feeling good. I have to admit, I was really, really nervous about this trip. In the past, when my husband and I have traveled abroad, I’ve always ended up feeling like death warmed over. But with the exceptions of a few days when I just got too worn down and started feeling it, I felt pretty good for the majority of the trip. And I didn’t for a second feel like I was missing out on anything, food wise. London was by far the easiest of the three destinations to eat and despite all of my planning, I really didn’t end up needing a lot of the contingencies that I had planned for this city. We mostly ate by popping into wherever sounded good (well, that’s not true, we made a few reservations, but you get the idea) and by and large, I never had trouble finding something to eat. Just in case, I always had some trail mix and a packet of almond butter in my purse (yeah, I’m that lady), but I never really had to eat my desperation snacks. Since many people have asked – either directly or through thinly-veiled disbelief (“ummmm what’s the point of going to London if you can’t eat fish and chips? 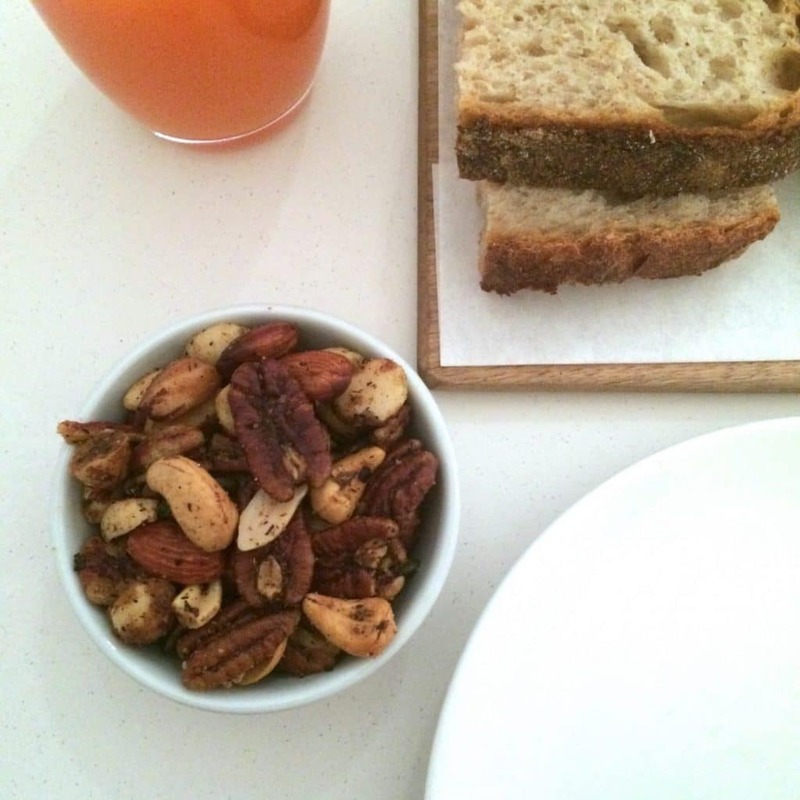 ?”) – I am sharing where and what I ate. Hopefully it will be entertaining to the nay sayers, and helpful to anyone heading to London soon! So, let’s start at the beginning. 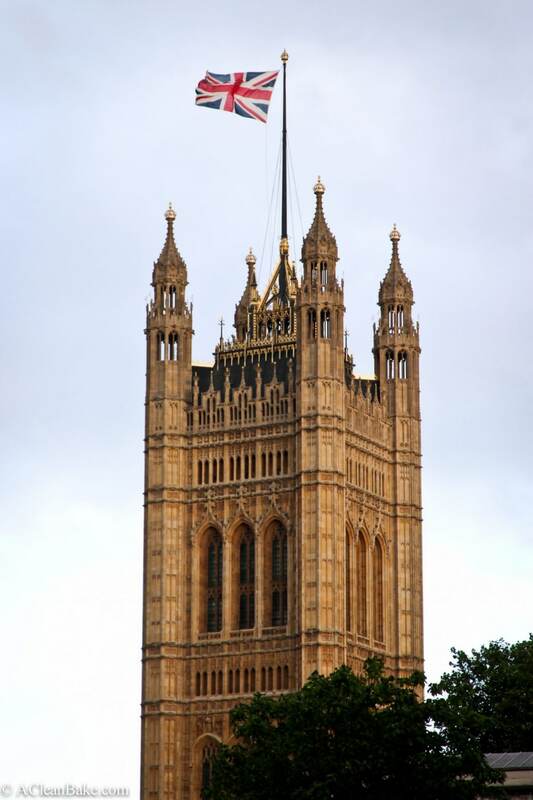 We flew in and out of London, so we ended up splitting our time there into two sections. We spent the first two days and the last two days of our trip in the British capital, staying in an Air B&B (<— book through this link to get $25 off of your reservation!) studio apartment in Chelsea at the beginning of the trip and in a hotel next to Paddington Station at the end of the trip. This was the only hotel we stayed at throughout the trip, so our meals were more restaurant-heavy at the end. Although it wasn’t technically in London, let’s start at the airport the night of our flight out: we left on the 9pm flight from Chicago O’Hare, so had dinner at the airport before we boarded. 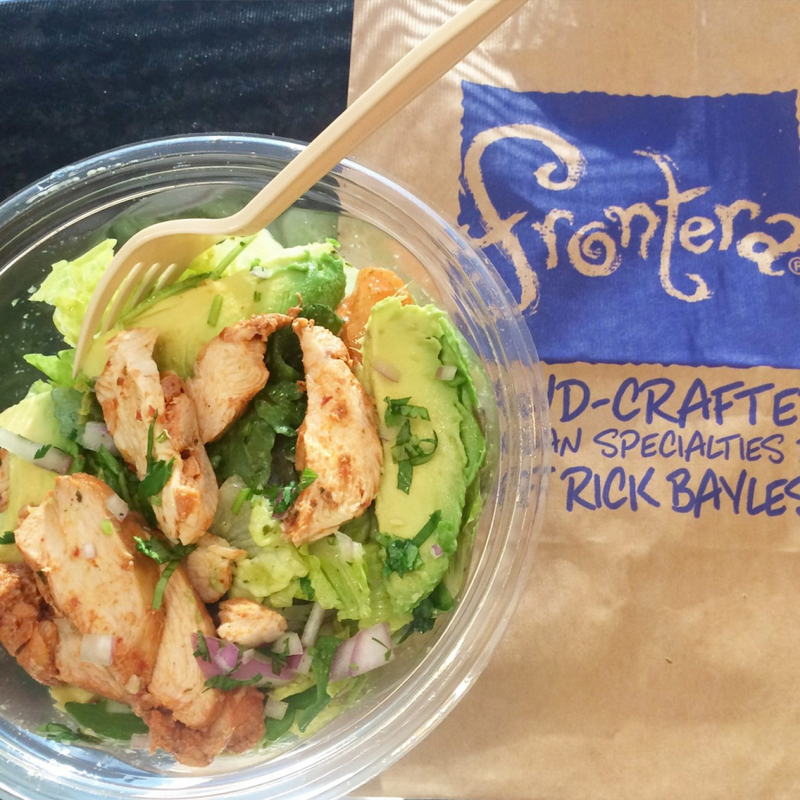 Whenever I travel on a mealtime-ish flight, I get the same thing: the Taqueria Salad (hold the tortilla strips and cheese, add chicken) from Frontera Grill’s O’Hare outpost in Terminal 1. They also served a mini dinner on the plane. I put in a request for gluten-free meals when I booked the flights and was surprised (because in the past, my requests have been ignored) to receive an edible and nutritionally-balanced dinner of grilled chicken breast, wild and white rice, and broccoli. It was served with butter and some sort of a hollandaise sauce on the side, so those were easy to skip. 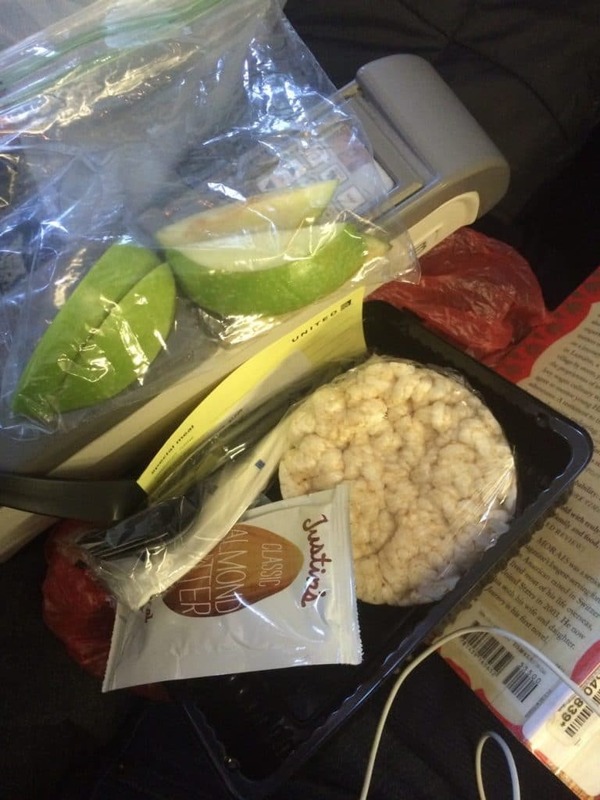 For the “pre-landing snack” (aka light breakfast), the gluten-free option was kind of gross – applesauce and a shrink-wrapped rice cake (seriously?!) – so I tapped into my stash of plane snacks that I had brought from home: apple slices and Justin’s almond butter, plus a handful of trail mix. Day 1 We landed in London late morning on a Tuesday and, after dropping off our bags at our Air B&B flat, went wandering around the neighborhood looking for something to eat. We stumbled onto a café called Muriel’s Kitchen, where they had a classic lunch menu (sandwiches, salads, quiche, etc), but also a really nice case of prepared foods. Instead of ordering an entree, I just asked the server for a piece of the grilled salmon from the case, and a side of grilled veggies (which was on the menu), plus a green juice. Overall, the menu was wonderful and incredibly diverse. While I had a great and dietary-compliant meal, Bryan had a meat pie and a scotch egg, because, when in the UK…So, happily, there was something for everyone. We did a TON of walking throughout the whole trip, and developed the habit of stopping for coffee and/or tea breaks riiiiight before we were about to collapse. 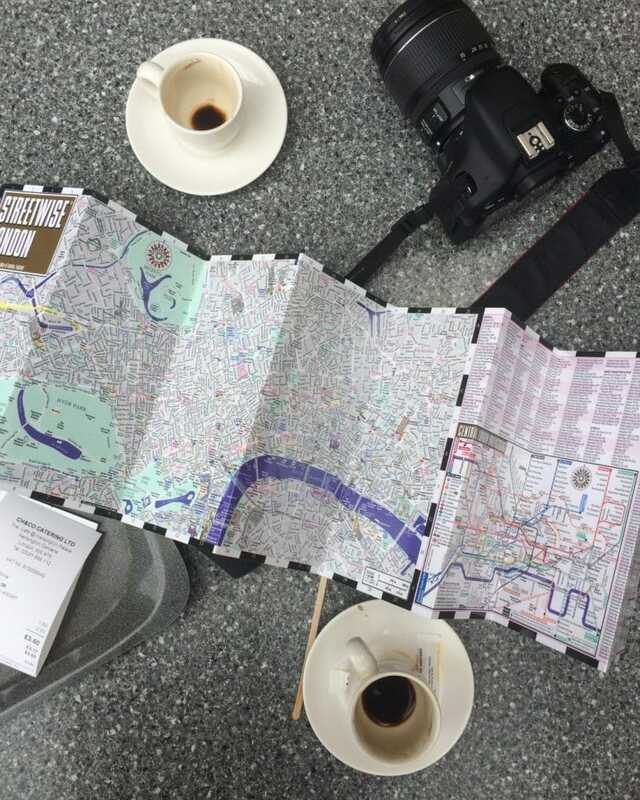 In London, most of those breaks were at Costa Coffee, a chain that has a location about every block or so. It’s the Starbucks of London (though they also have Starbucks, too). 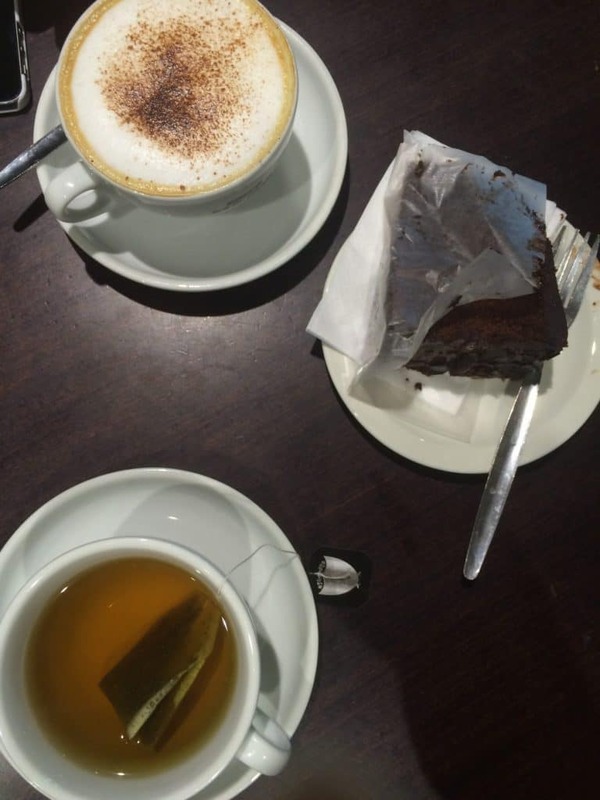 On that first coffee break, Bryan also had a piece of flourless chocolate cake that looked surprisingly legit for a chain coffee shop! We wandered for the rest of the day and tried to go to Nopi (more on that in a second) but, of course, were too naïve and jetlagged to have realized that we needed to have a reservation so, rather than wait until 9:30pm to be seated, we ended up wandering around Regent Street and finding this little alleyway of restaurants, including a Gordon Ramsey restaurant. But we bypassed Ramsey and instead ducked into Tidbits Buffet for its more casual atmosphere and younger clientele. We had no idea what it was, but just liked the vibe of it. It turns out to be a vegetarian buffet restaurant, but that description doesn’t even begin to give the place appropriate credit for the quality of their food. I piled my plate high with falafel with harissa, green pea and mint salad, dried green bean salad, Moroccan carrot salad, green power salad (broccoli, edamame, and snap peas), roasted teriyaki seeds and balsamic tomato and tofu salad. 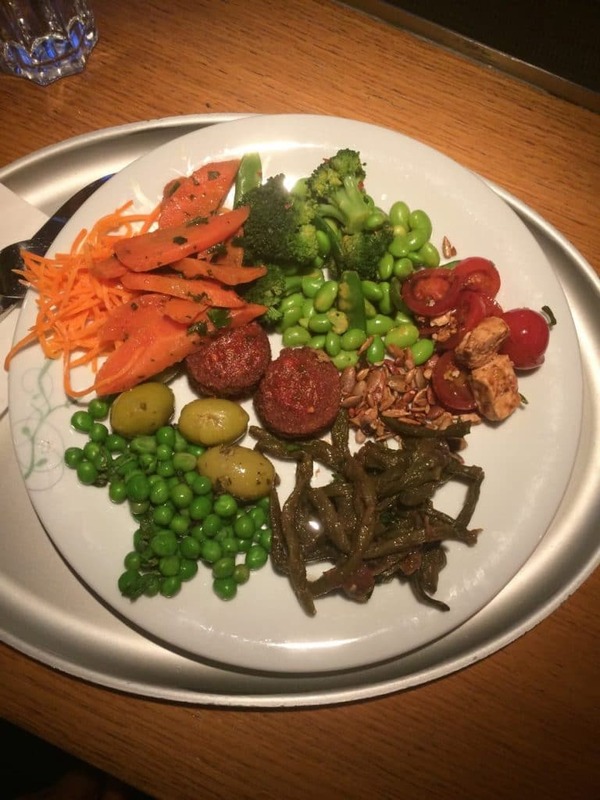 Normally, I would avoid legumes (soy, chickpeas/falafel) but given that there was no meat, I decided to go for it – I needed some protein in the meal – and luckily my body reacted well. Overall, everything was outstanding but the Moroccan carrots are the stuff of dreams. After dinner, we stopped at the Sainsbury’s supermarket near our apartment for a bar of dark chocolate for me and a bar of Cadbury Dairy Milk for Bryan (my husband) for dessert, plus some eggs for breakfast. After the first night in our Air B&B, I woke up super late and made scrambled eggs at noon in the apartment for both of us and we headed out for the day. We walked from our apartment to Kensington Gardens and were happy to find The Orangery, a really cute, if touristy, café at Kensington Palace. The weather was outstanding so we grabbed a table outside and had our quickly-becoming-customary espressos while we planned the rest of our day. We had gotten such a late start (thanks, jet lag!) that we ended up skipping lunch. After – you guessed it – way more walking, we went back to the flat, changed, and headed to dinner at Pure Taste Restaurant. This was a major event for me: it’s an entirely-Paleo restaurant, and the only one of its kind in the UK (and I imagine one of only a few in the world, don’t you think?) and I had made the reservation weeks before the trip so suffice it to say I was really excited for this highly-anticipated dinner. It was amazing. I mean, any restaurant where I can eat the bread (and literally everything else) is bound to be pretty great, but this was really an experience. We started with the bread basket – herbed focaccia (outstanding) and sourdough (not terrible, but not my favorite) with avocado-based “butter” for spreading and olive oil and vinegar for dipping. Then, the chef sent out a little pot of a new kind of macadamia-based dairy-free butter that she has been working on. I’m not kidding you when I tell you I ate the stuff with a spoon. It was SO spectacular: fatty and rich, yet mild, it melted in your mouth like actual butter. I’ve never had a better non-dairy butter facsimile. 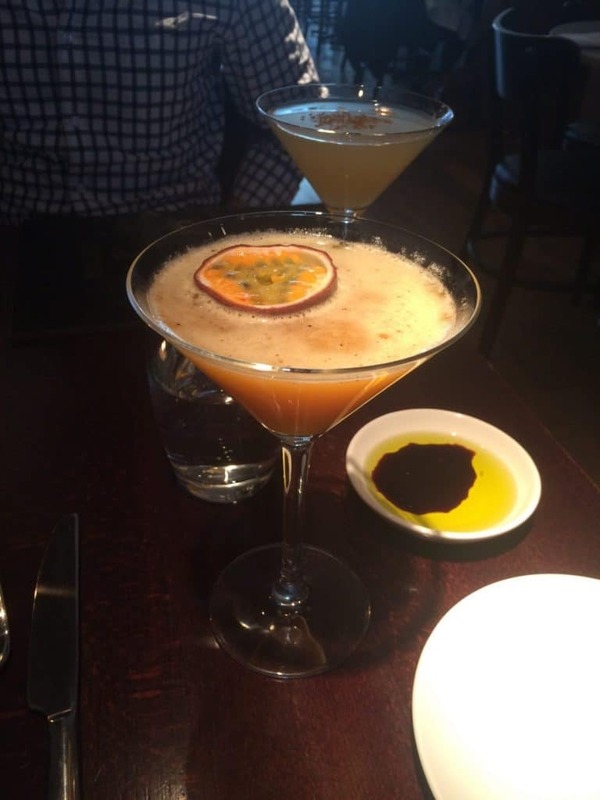 We also ordered cocktails; I had a passionfruit situation that was really refreshing. I really don’t remember the details, except that it was passionfruit-based and tasty. After, or kind of with, the bread the chef sent out an amuse bouche of feta parcels (grain-free puff pastry filled with macadamia-based “feta”) served with pesto and a partially-dried tomato which was really a pleasure to eat. The puff pastry was not as flaky as the wheat-based stuff but was pleasantly crisp and light like you would expect. I was really impressed. For an appetizer, we ordered smoked trout with pickled rhubarb, fennel and charred oranges. The trout basically tasted like smoked salmon and the pickled rhubarb reminded me of a slightly tangier and certainly more fibrous version of pickled turnip (that you get at a middle eastern restaurant, for example). 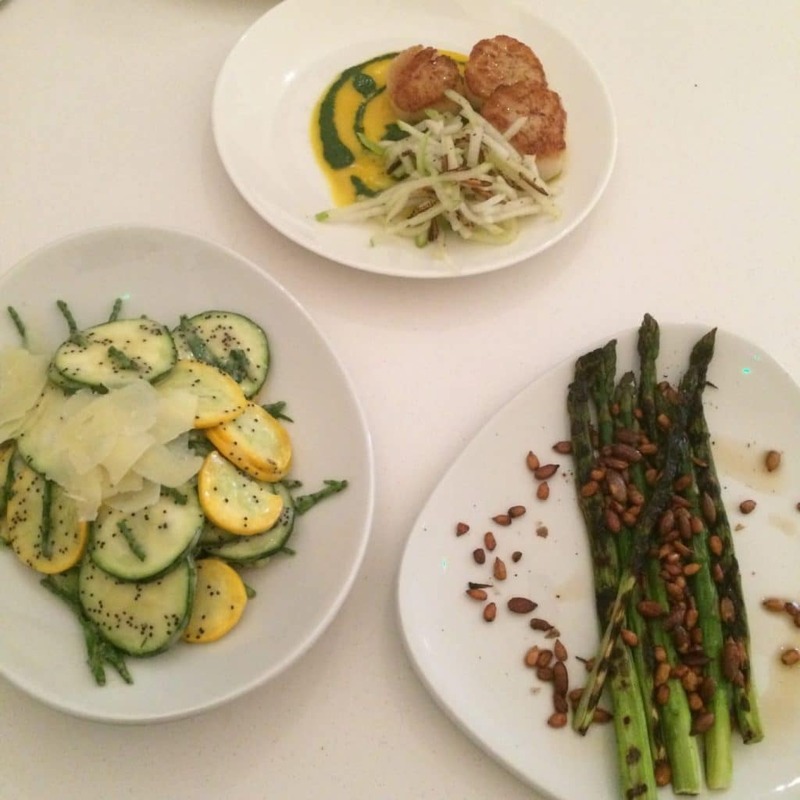 The fennel was refreshing and let me just tell you that char plus orange flavors go together really, really well. 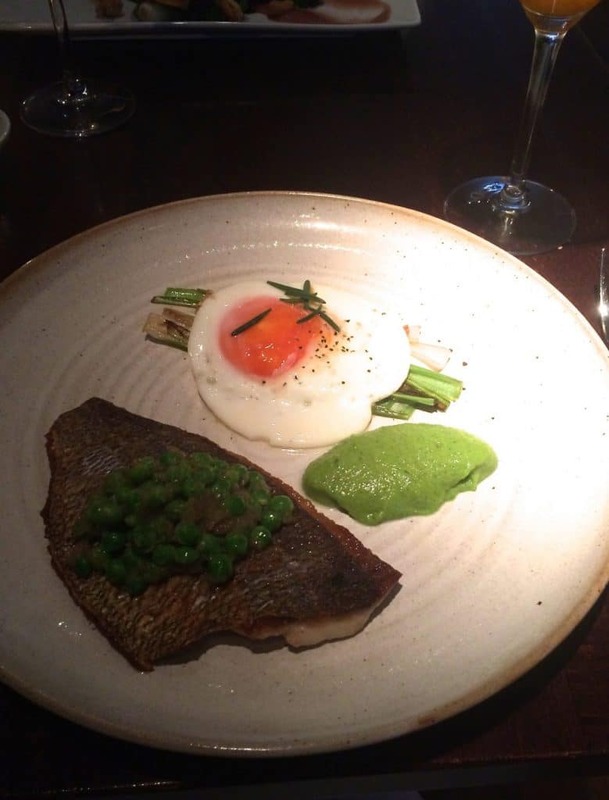 For my entrée, I ordered fish (I can’t remember what variety) with pea puree and a runny egg. Throughout the trip, I ate a ton of eggs, and never ceased to be amazed by how vibrantly orange and flavorful the yolks were. Why can’t we get eggs like that in the US? When it came time for dessert, I was stuffed but Bryan convinced me to ordered something for the sake of blog research, if nothing else! There were several large dishes, but they also had a place of petite fours (small, sweet bites), which the server actually tried to steer us away from but I really liked the sound of. So we ordered them and I think the server took it a little personally, but I really loved them. The plate contained a raspberry coconut cookie, cashew butter cup, raw lemon bar, and some kind of anise cookie that wasn’t terribly memorable. The first three were addictive though. Overall, this was one of the best dinners of the trip. On our third day, we spent the morning in London after a breakfast of scrambled eggs in the apartment (not at noon this time), then headed to St. Pancras station to catch our train to Paris. The train station had several sit-down cafes, but we were running a bit late for that, so I grabbed salads from Chop’d (all of their salads were gluten-free and most were grain-free too) to eat on the train. By the way, from what I saw, many of the chain restaurants in central London seemed to have several guten-free options of their menus, not just this one. Anyway, my salad had chopped romaine, shredded chicken, shredded beets and carrots, mashed avocado and sunflower seeds. I topped it with balsamic vinaigrette (which, unlike the bottled garbage that you get in the US, was actually just oil + balsamic vinegar). I also grabbed a small bar of super dark chocolate, which I had for a snack later. Dark chocolate was so much easier to find in Europe than it is in the US. I went through my fair share of bars over the course of the trip! Oh, and I had some mixed nuts that I had brought from home with the chocolate, too. That was my last meal in London until the end of the trip. After Paris and Istanbul, we headed back to London to finish up the trip. 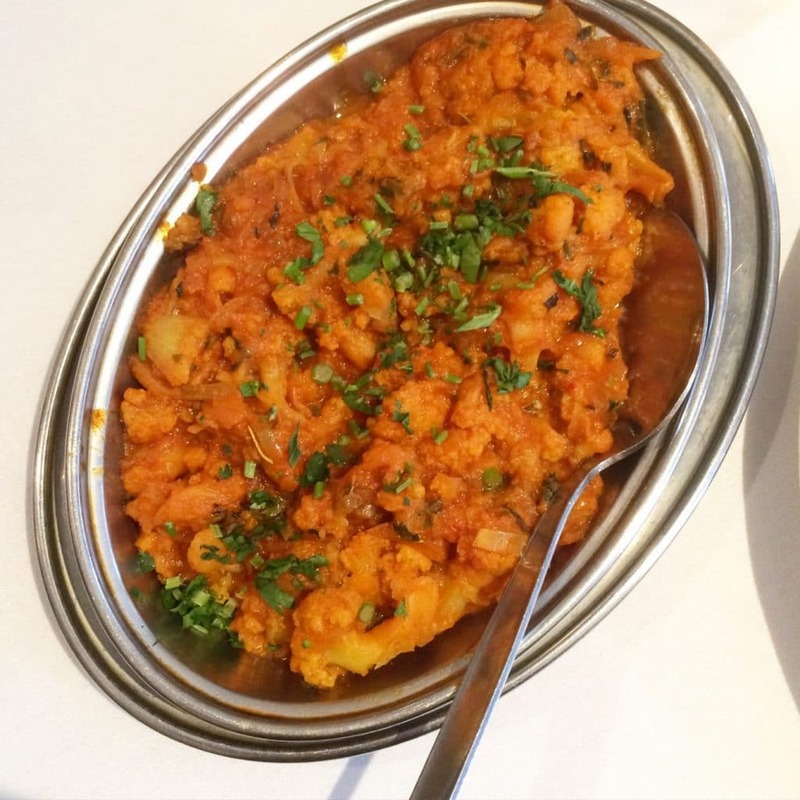 We landed right around lunch time and, after checking into our hotel, went to grab some Indian food around the corner at Connoisseurs Indian Tandoori. I don’t typically eat Indian food because it’s hard to find dishes that aren’t swimming in cream, butter and/or wheat. This restaurant had a massive menu, and I asked a lot of questions to make sure I was getting dishes that wouldn’t upset my stomach. 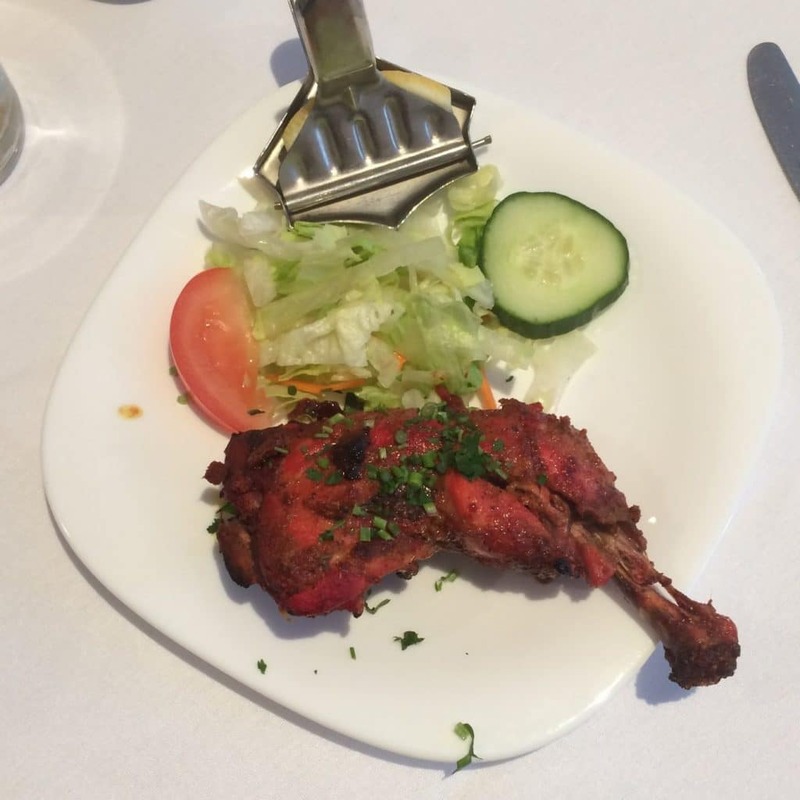 I ordered tandoori chicken and a side of cauliflower stewed in a (kind of buttery, oh well) tomato sauce. There were a ton of vegetable options, and probably far more protein options that would have been ok, but the flavors of both of my dishes were outstanding. 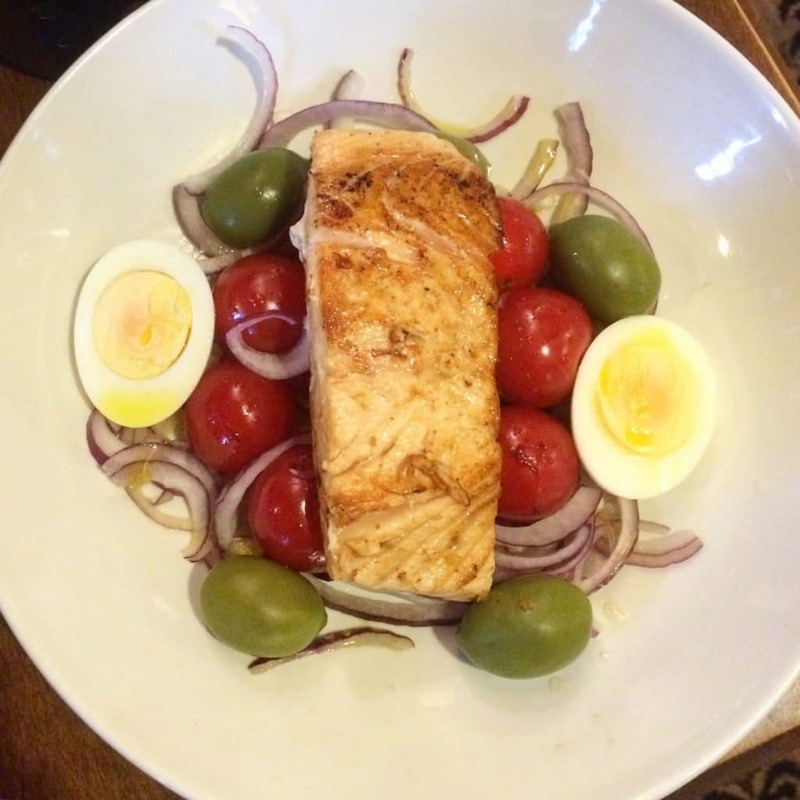 For dinner, we went to Sawyer’s Arms, a neighborhood pub, so that Bryan could get fish and chips, and I (perhaps subconsciously missing France) ordered a “salade Nicoise” which consisted of a piece of grilled salmon over red onion, tomatoes, a hard boiled egg and olives. To be fair, it was actually supposed to contain potatoes, which I asked them to leave off, but they completely forgot to give me the green beans that were on the menu description and there was literally not a single mention of, you know, lettuce. It was super weird, but still delicious. 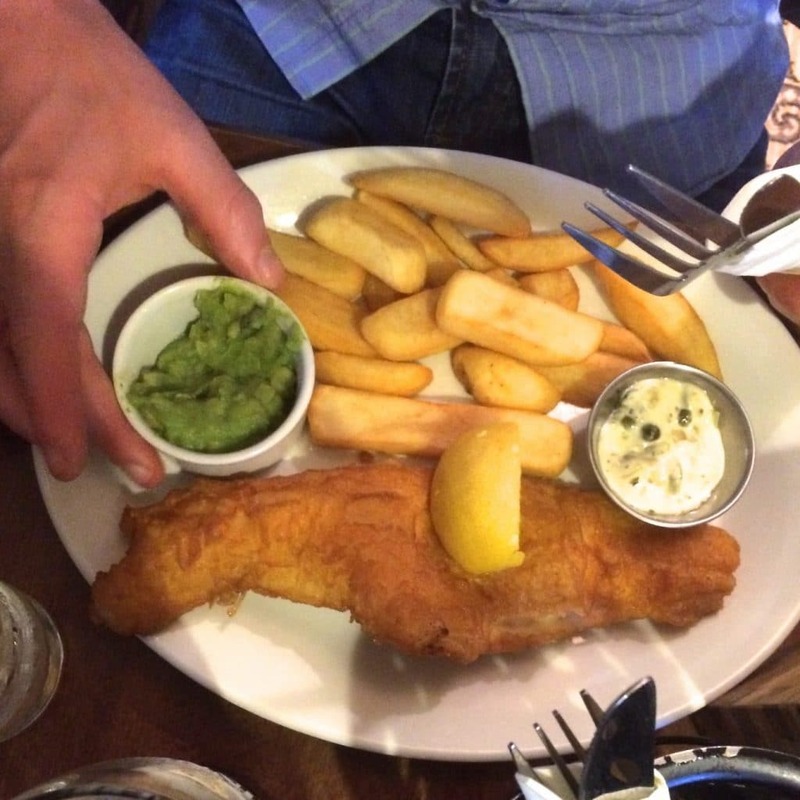 And Bryan got a pretty legit plate of fish and chips with pea puree, which was, unfortunately, not gluten-free. But I scraped some of the breading off of the fish and tried a piece. It was fresh and flavorful and perfectly prepared. 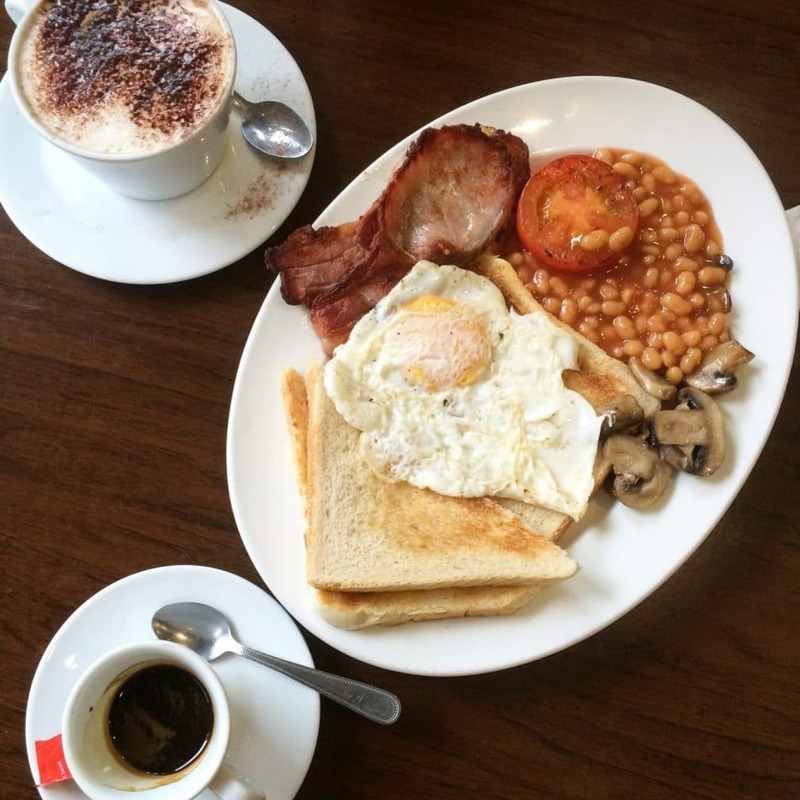 On our last full day, we started the day at La Tazza Café near our hotel where Bryan got a full English breakfast. I stole some tomato and mushrooms, but mostly just ate a Justin’s almond butter packet (with a spoon; I know, so classy!) 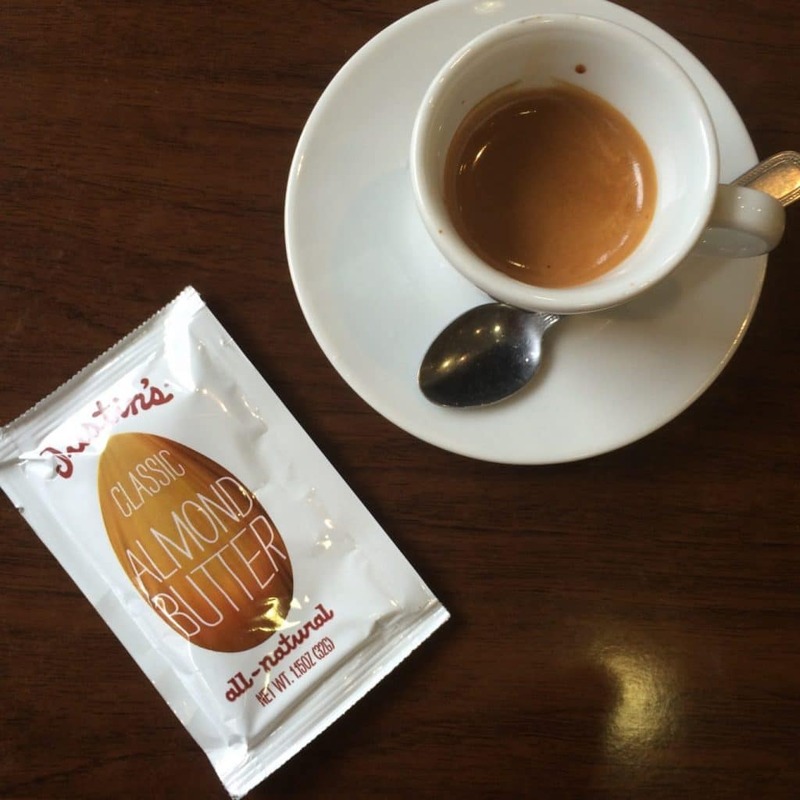 with an espresso. I swear, it was not as unsatisfying as it sounds. 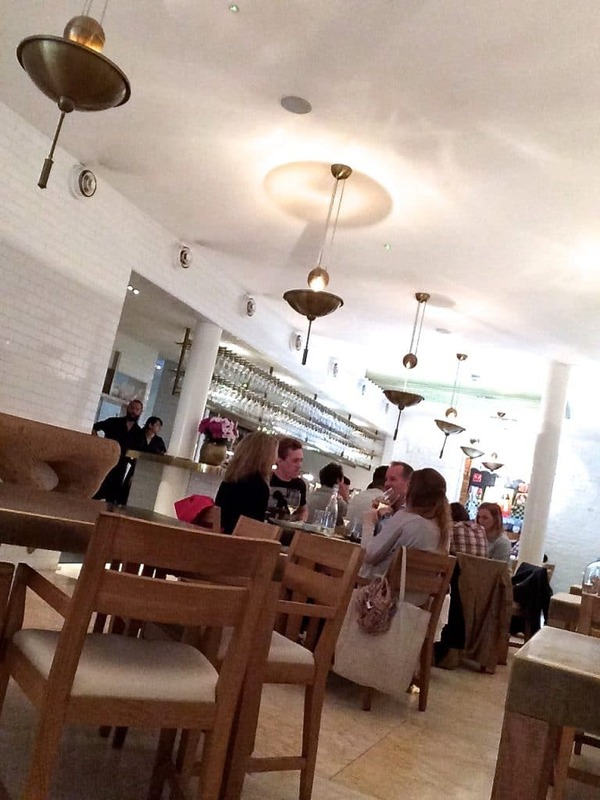 After wandering for quite some time, we found ourselves back in Soho and starving. I dropped into the Whole Foods looking for a salad bar or trail mix or something and didn’t find anything that really appealed to me. I did pick up some snacks for the plane home the next day though. So we wandered some more and found ourselves a block away from Nopi. It was ridiculously late – around 3:00, and the restaurant closes at 4:00 – but I just couldn’t walk away without at least trying to get a table. To our surprise, we had no problem being seated (it turns out their kitchen didn’t close until about 4:30 or so in practice) and I had to exercise an immense amount of self control to avoid ordering THE ENTIRE MENU. We finally settled on mixed spiced nuts to start, scallops with apple and nettle (tasted kind of like toasted wild rice) salad and lemon puree, asparagus with brown butter and sunflower seeds, and zucchini salad with broad beans, samphire (supposedly a sea vegetable, but had a fennel-like anise-y flavor to it) and lemon vinaigrette. 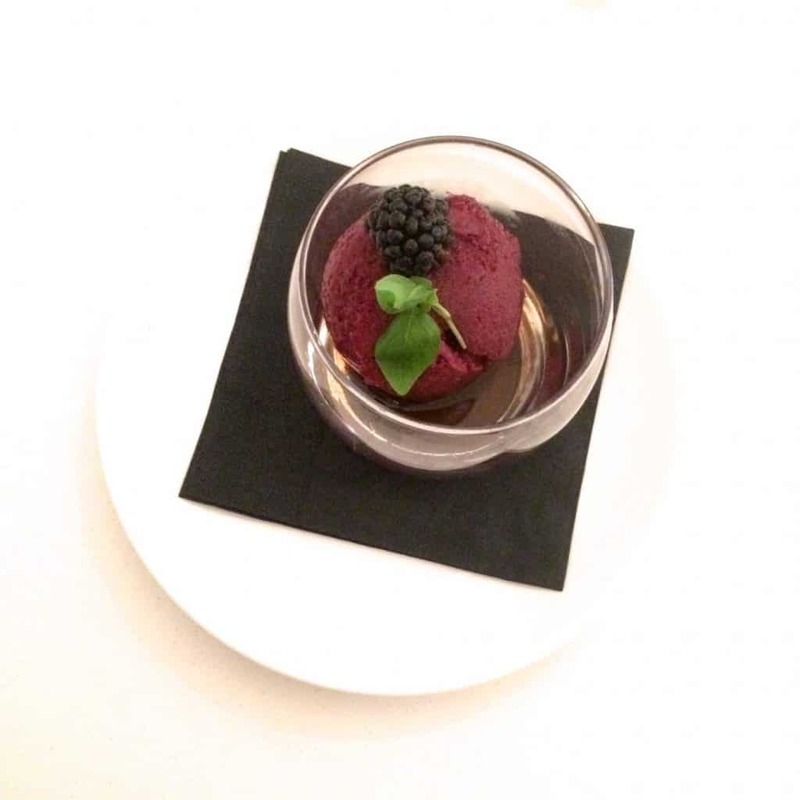 Bryan ordered black currant sorbet for dessert, too, but I ended up eating most of it. 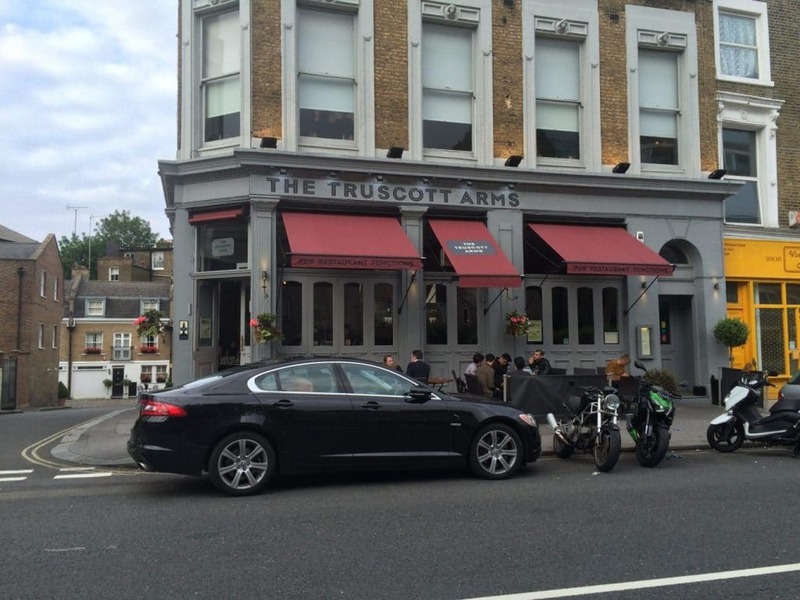 For dinner, we had made a reservation at a pub in Notting Hill called The Truscott Arms, which was recommended to me by Kathryn (LondonBakes.com) for their gluten-free fish and chips. I made a reservation and we were seated in the upstairs (formal) dining room where they were serving their Sunday Roast menu, which were some of the biggest platters of food I have ever seen (and that’s saying something, since I come from an Italian family). After a very late lunch, neither of us was in the mood for a massive platter of meat and potatoes, so I managed to sweet talk the manager into allowing us to order off of the bar menu instead. To be fair, I didn’t do much sweet talking and they were incredibly gracious and accommodating to us clueless foreigners. 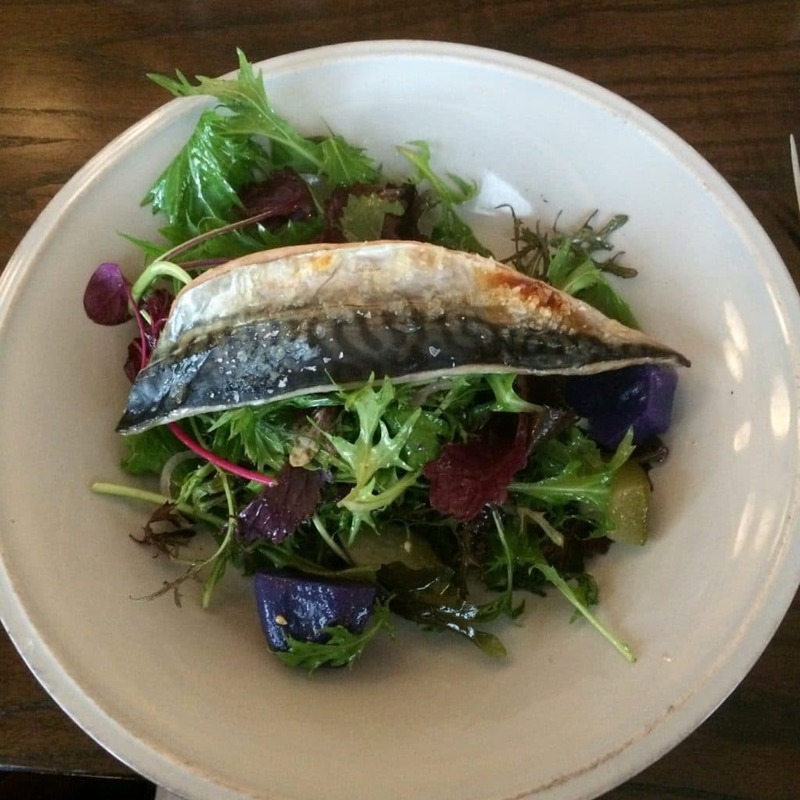 Bryan had a burger and fries, and despite coming to the restaurant for the GF fish and chips, I made a last minute decision to try a mackerel dish instead, which ended up being kind of a salad with mixed baby greens, pea shoots, purple potatoes and pickles. The fish was excellent, but overall the dish was really salty. Oh, and we also had the local cheese platter with fig jam to start. Normally, I wouldn’t eat this much cheese, but I was feeling good, and it was all local and very good quality so I tried some of each kind. I just skipped the bread, obviously. Breakfast on the last day of our trip was at a Lebanese café called Le Gourmet, where I had the scrambled eggs and smoked salmon on toast, hold the toast. Bryan had a full Mediterranean breakfast which was huge, and I ended up eating most of his pickled veggies. After breakfast, we packed up and left for the airport. Other than a tea at another Costa Coffee at Heathrow, this breakfast was my last meal in London. For lunch, I had the gluten-free meal on the plane which was, frankly, terrible: dry chicken breast, salty instant mashed potatoes, gravy, a gluten-free roll that tasted like cardboard and gave me a stomach ache and chocolate pudding that I passed off to Bryan. I ate most of it because I was starving but, despite giving the airline an A for effort, the food was horrific and not worth taking a photo of. 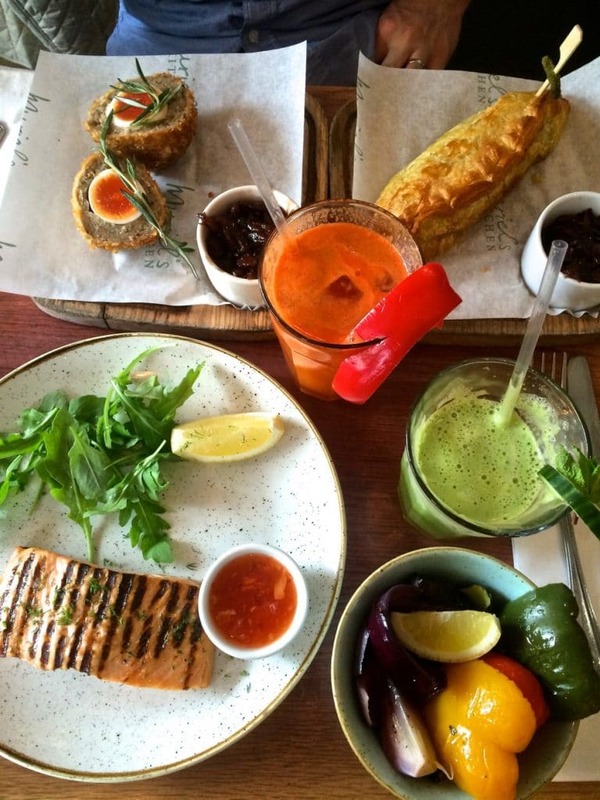 Overall, I found eating gluten-free and (mostly) paleo in London to be exceptionally easy – much, much more so than I expected it to be in a country that is stereotypically known for meat pies, fried food and beer. I felt like I barely scratched the surface of all of the culinary options this city had to offer, and I can’t wait to go back and eat more! 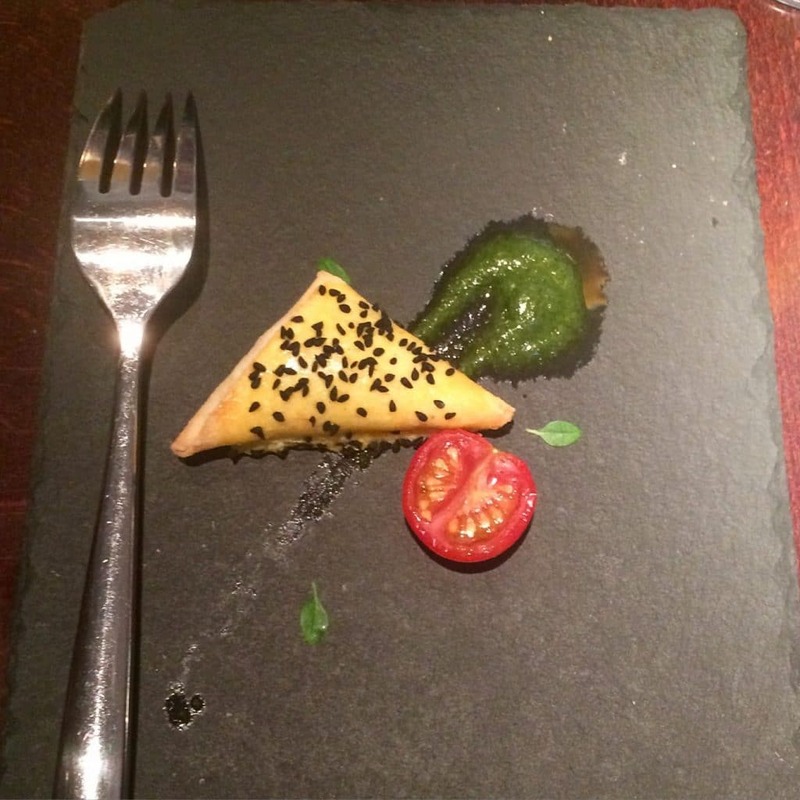 For a printable guide to all of the restaurants where I ate in London, please click here (or right click and select “save link as” to download the file). 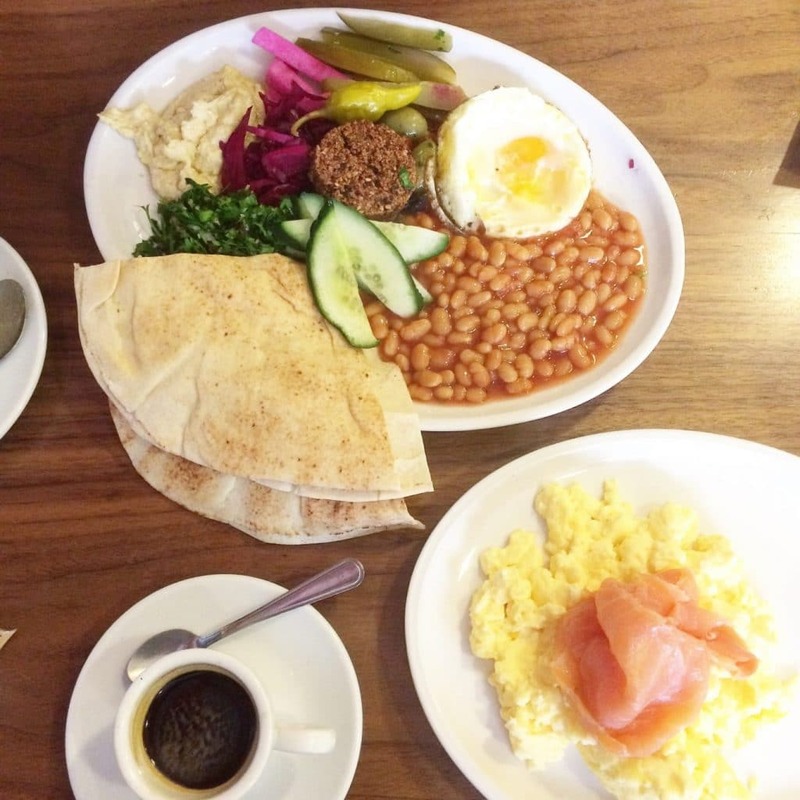 And for even more information, check out the posts from before I left about how I planned to eat well in London, Paris and Istanbul. 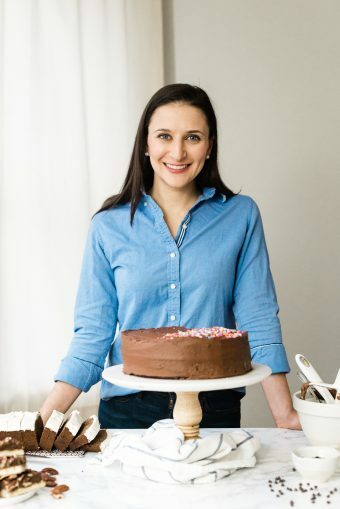 This was so much fun getting to see your food adventures in London – and even though I’m neither gluten free nor paleo, I think I could have gone the whole trip eating what you ate (save for fish and chips because I’d just have to!) because it looked so good! That runny egg with the fish? Totally calling my name – you’re so right their yolks are so orange and I love it! Okay honestly, you ate pretty darn delicious for having to stick to a specfic diet! Seriously, everything you ordered/ate are things I would totally drool over. Plus I think it’s still important to try and eat as healthy as possible even when on vacation so these posts are super beneficial! Oh and that paleo restaurant sounds amazing! I’m not paleo but I would SO eat there just for the sake of trying something different. You’re making me crave some travel time!! I definitely did!! At least half of the reason I travel – no, more than half – is for the food and I was NOT disappointed! I have to admit that I felt better on this trip than I have in previous trips, especially in France where I used to binge on bread and pastry every time and go home feeling like a lethargic whale. That’s a gross image. Ha. Oh the paleo restaurant was so great. My husband eats anything and everything and really enjoyed his meal, and they serve a huge clientele of non-paleo-followers who just like the delicious food! Whoa I didn’t know egg yolks could be orange! Why is that? Also, the vegetarian buffet looks delicious. And wow, Pure Taste sounds absolutely amazing!! 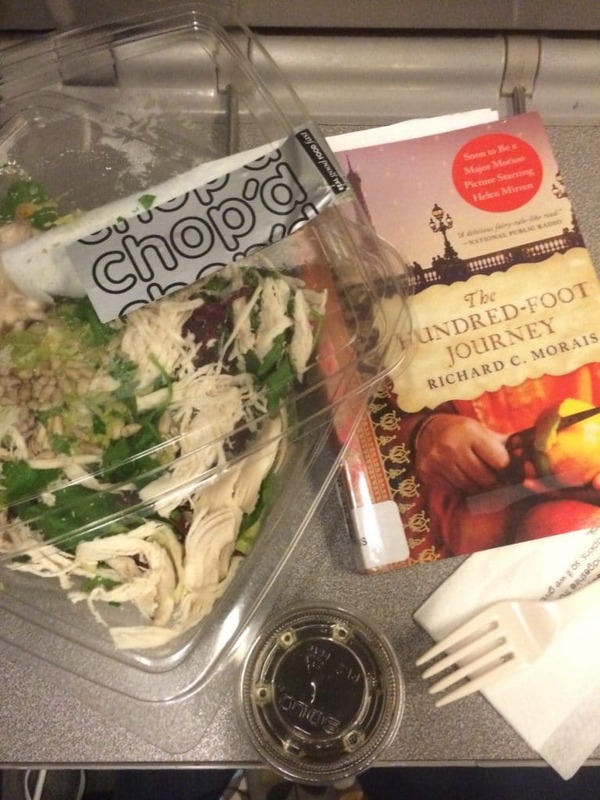 Such a yummy food journey 😉 Thanks for sharing, Nora! Me either!! I really don’t remember that amazing hue of the yolks from the last time I was in Europe. I guess I wasn’t paying enough attention. The different color has something to do with the chickens’ diet (it is higher quality), and someone suggested it was because they are eating more grasses compared to the US where chickens eat grain, I think. Don’t quote me on that though! Either way, the color and flavor put US eggs to shame!! I heard in each country they feed the chicken according to what color the people there are expecting the yolk to have. Yeah, I don’t think that’s right.